A large team of researchers from China, Taiwan and Australia has found evidence of faster-than-expected shifts in Earth's magnetic polarity several thousand years ago. 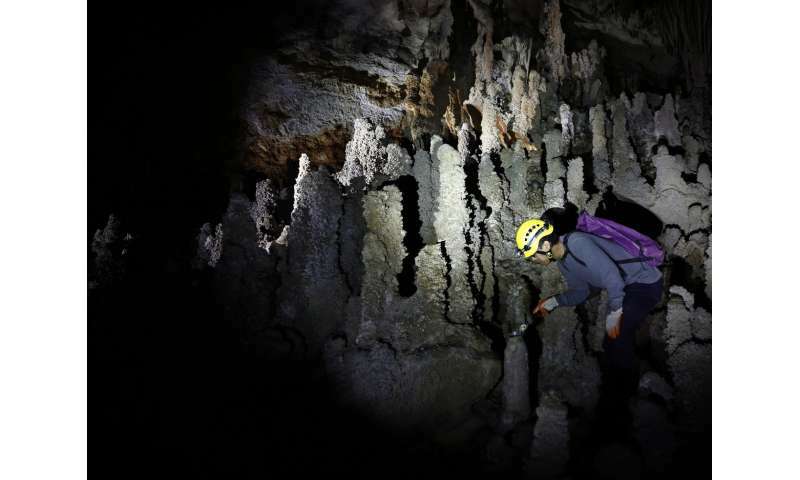 In their paper published in Proceedings of the National Academy of Sciences, the group describes their study of stalagmites found in a cave in China and what they found. Prior research has shown that the Earth's magnetic field sometimes reverses polarity—such an event has been experienced only once by modern humans, but that was long before the age of satellites and electronics. In the modern age, such a reversal could spell trouble for many devices that we have come to rely on. For that reason, scientists study past reversals in the hope of predicting when the next might occur. In this new effort, the researchers traveled to the Sanxing Cave in Guizhou Province in southern China. There, they obtained samples of stalagmites (columns of calcium salts that rise from the floor of caves, caused by dripping water), which hold evidence of changes to the magnetic field going back thousands of years. The Earth's magnetic field is generated by liquid metal churning at depths 1,700 miles below the surface. But sometimes, that churning can change slightly, affecting the magnetic field. Prior research has suggested that a full reversal would likely take thousands of years, but this new research suggests it can happen in as few as 100. The researchers report that the stalagmite sample taken from the cave showed evidence of magnetic field changes from 107,000 to 91,000 years ago—a span of 16,000 years. By studying the sample very precisely using a high-resolution cryogenic magnetometer, the researchers were able to trace changes in the magnetic field more precisely than has ever been done before. In so doing, they discovered that approximately 98,000 years ago, a magnetic reversal occurred over just a century and a half, approximately 10 times faster than had been believed possible. The researchers found several other phase changes, as well, with various degrees of fluctuation strength. They also found that when the magnetic field was weaker than normal, more fluctuations in strength occurred. They suggest such fluctuations likely caused some instability in convection in the planet's outer core. Polarity reversals of the geomagnetic field have occurred through billions of years of Earth history and were first revealed in the early 20th century. Almost a century later, details of transitional field behavior during geomagnetic reversals and excursions remain poorly known. 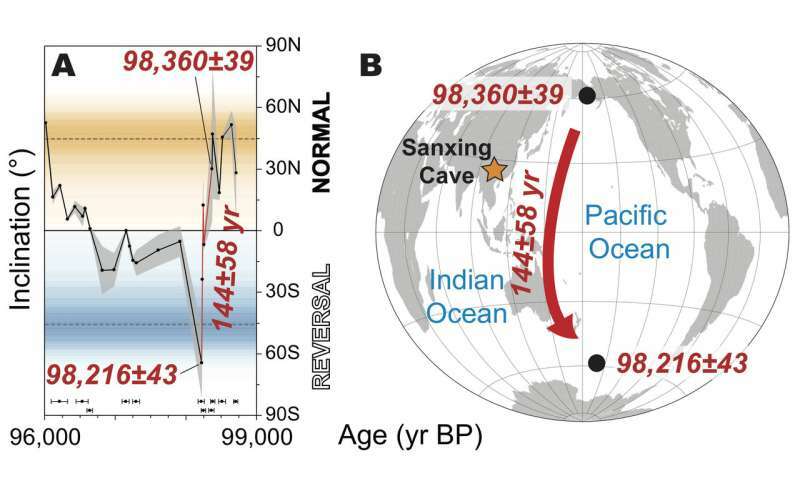 Here, we present a multidecadally resolved geomagnetic excursion record from a radioisotopically dated Chinese stalagmite at 107–91 thousand years before present with age precision of several decades. The duration of geomagnetic directional oscillations ranged from several centuries at 106–103 thousand years before present to millennia at 98–92 thousand years before present, with one abrupt reversal transition occurring in one to two centuries when the field was weakest. These features indicate prolonged geodynamo instability. Repeated asymmetrical interhemispheric polarity drifts associated with weak dipole fields likely originated in Earth's deep interior. If such rapid polarity changes occurred in future, they could severely affect satellites and human society.